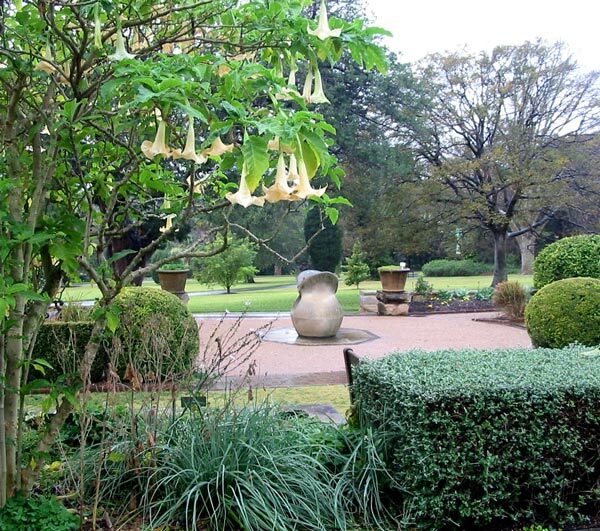 I'm inexperienced at writing about visits to Botanic Gardens. I don't write down any details (names of plants would be helpful) and I don't keep the brochure (nor do I read it). My behaviour at the Sydney Botanic Gardens is no exception. I first visited this huge down-town expanse on a rainy day - of course the botanic gardens looked amazingly green and shiny - fat green leaves, big green spiked plants and trees, green sloping lawns. But for me the huge specimen trees made the greatest impression. The Moreton Bay Fig trees are huge with dense curving trunks. They provide strong shade in summer, as well as shelter from rain. There are also many palm trees reaching way up into the Sydney sky - and, of course, those Australian gum trees. On my return visit the sun was shining, and I tried be a more conscientious visitor (in other words, I looked at the botanic gardens brochure map - briefly). 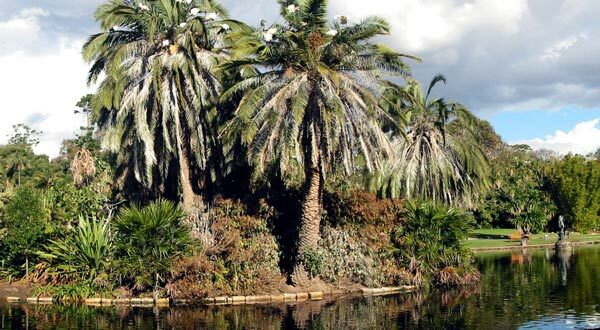 Thus I found the BIG POND with its islands of palm trees - flocks of squabbling egrets were trying to land and balance on the bendy tree branches. Many areas like the Rose Garden were in their mid-winter transition, but the Herb Garden with its sculpture and paths was plant-full. There were old-lady seats everywhere - under trees, facing Sydney harbour, facing the backdrop of strangely beautiful shining high-rise buildings - seats for solitude and deep book reading, seats for picnicking, seats for watching plants and people. After two visits to the Sydney Botanic Gardens I have extremely happy ambience memories (considering my visit was in the middle of winter). But next time I attempt to be a roving Moosey reporter I will take a notebook - and more photographs. And I'll try to visit mid-summer to see what's changed.